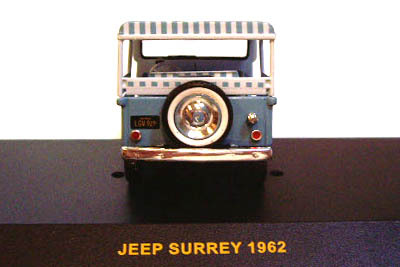 Not surprisingly the Jeep Surrey Gala has been the inspiration for a few kiddie toys over the years. 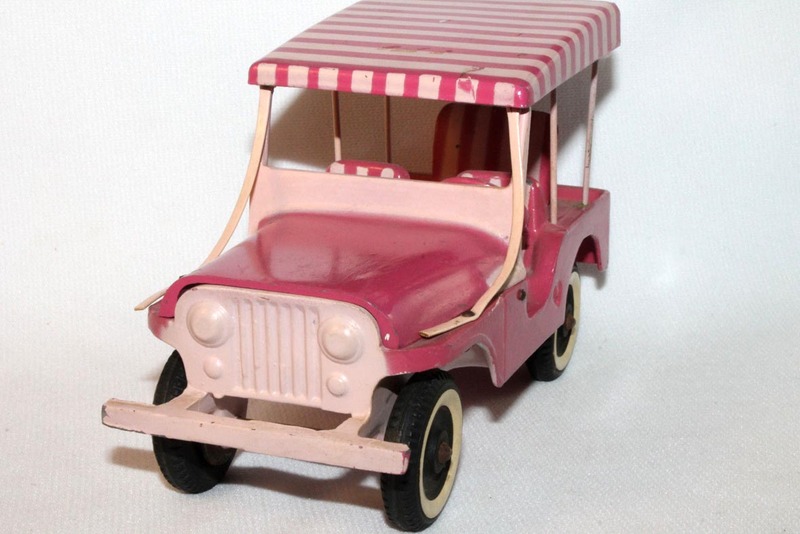 This cast-aluminum Surrey promotional model made by Comet for Willys in the 1950s may have been the first Surrey toy. See also a front view photo (110K JPEG) courtesy of vintage-toymasters on eBay. The popular Tonka version was sold from 1962-64. 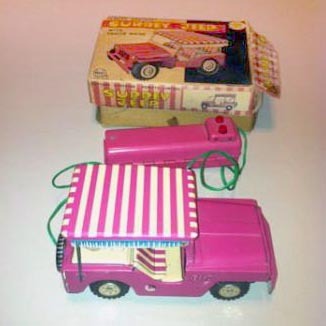 The Tonka Dispatcher has features of the CJ-3B as well as the DJ-3A, but the pink one was clearly intended to represent the Surrey. The two toys here were seen at Statewide 4-Wheel Drive Supply in Phoenix, Arizona: notice the size difference between the Tonka (right) and the tinplate toy (20K JPEG). See a front view of the Tonka (60K JPEG). And see photos of a Tonka with a full-size Surrey in the The Original Tonka Surreys. 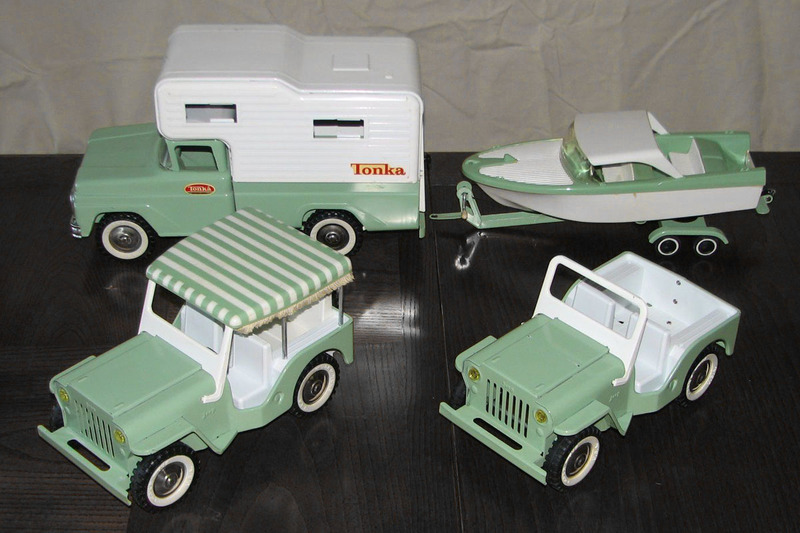 The Tonka also came in a Jade Green version, as part of the Outdoor Living set (170K JPEG) which included two Jeeps, a camper and a boat. This larger Japanese tinplate toy was obviously a knockoff of the 1960s Tonka. The dimensions are identical: 9-5/8" long, 5 1/8" high and 5" wide. The roof is also almost identical to the Tonka design, but the bright pink finish has details typical of Japanese Tinplate Lithography. Photos courtesy toyhelper on eBay. Bob Christy ran across a Japanese-made Surrey that appears to be a copy of the later, smaller Tonkas. He took this photo of it alongside two Tonka Jeeps. He says it has "no markings other than 'Made in Japan' on the bottom of the spare tire. 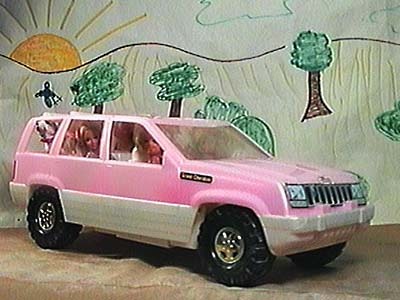 It's just about the size of the smaller Tonka Jeeps and has the same basic shape, looks like a copy almost, except it has more body seams. "See also a side view (90K JPEG). Thanks to Bob for the photos. 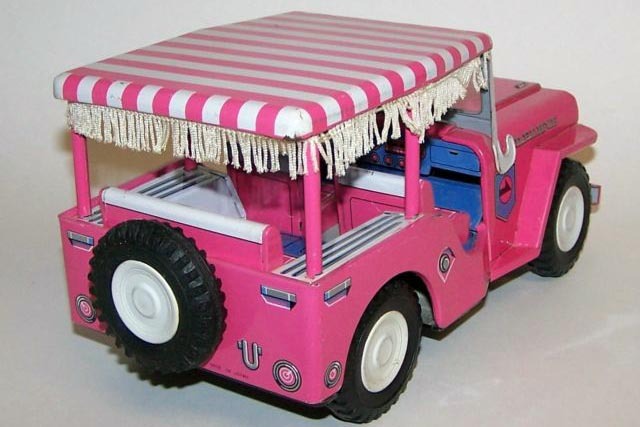 One of many Toy Jeeps by Marx was this remote control battery-powered tinplate Surrey. 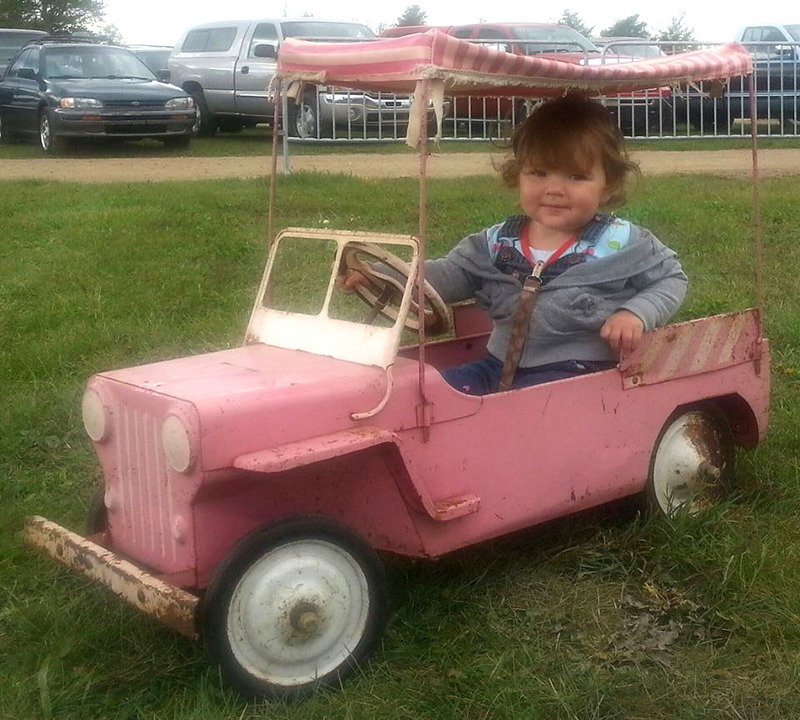 Interestingly, this example has blue fringe on the pink striped top; see a closer view of the Jeep (30K JPEG). 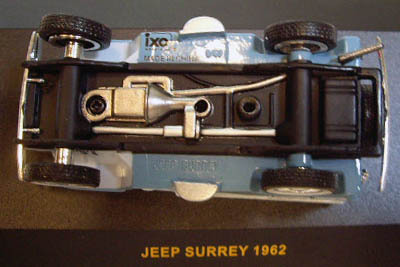 The Jeep Surrey Princess Model was one of the Hamilton Pedal-Drive Jeeps built by Hamilton Steel Products of Chicago. This photo is courtesy Anna Cinammon. 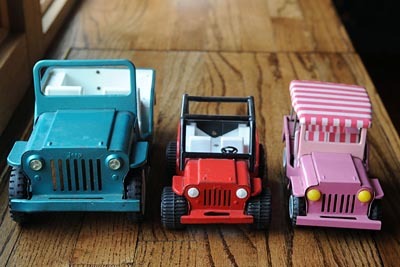 Like the Tonka Toys, the Hamilton Jeeps have a high hood and front grille design that appears to owe more to the CJ-3B than to the DJ-3A. 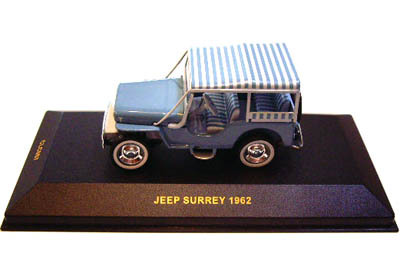 There was a flurry of interest in the Surrey among toymakers just after 2000, including the Matchbox version in their Elvis Presley series in 2001. 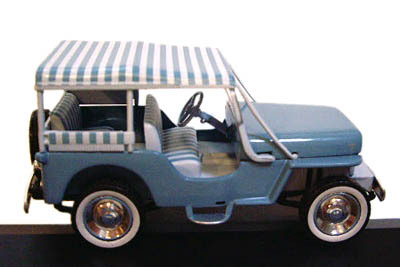 See more details on the Matchbox 1960 Jeep Surrey. Too bad Matchbox didn't continue with the Fountain Green and Cerulean Blue versions. But the 2002 re-release of the AMT 1/25-scale "Hogan's Heroes" MB model kit, does features a Surrey-style version in blue on the box (20K JPEG). 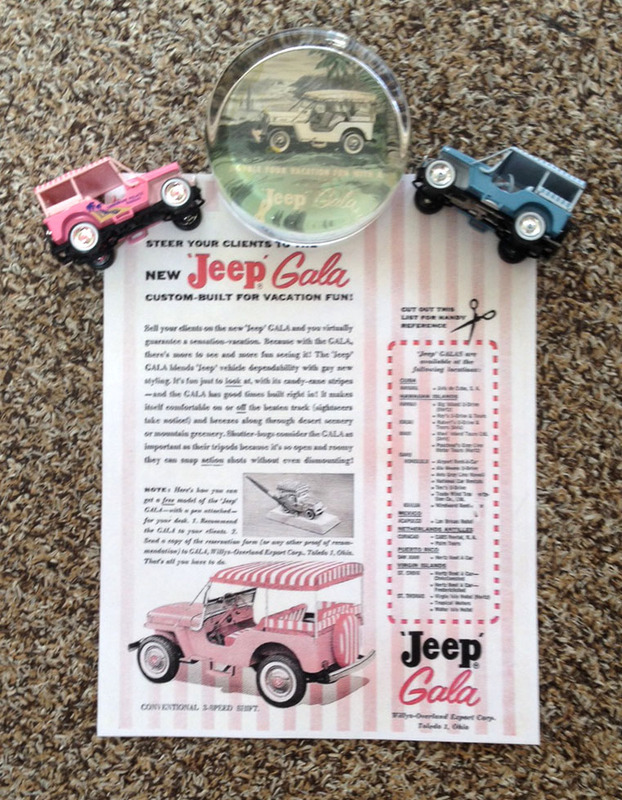 Colin says this 1:43 scale 1962 Jeep Surrey (or Gala) is "very detailed, and accurate in most areas. I don't know the date of manufacture or even if the toy is still produced." Colin describes the blue version: "Externally, it has the chrome bumpers front and rear (30K JPEGs), California license plates LGV 929, taillights and chrome gas cap; front windshield supports to the fenders, striped top; steps on both sides, 5 whitewall tires with chrome wheels and hubcaps with the "W" in the center; tailpipe at the rear of the left bumper; spare tire on the rear. It also has the surrey fringe around the top of the body; painted hood holddowns, drain holes on each side and the assist handles painted silver on the windshield, but minus the word Willys on the hood." "Internally it has the blue and white striped seats, correct steering wheel with horn button, column shift(! 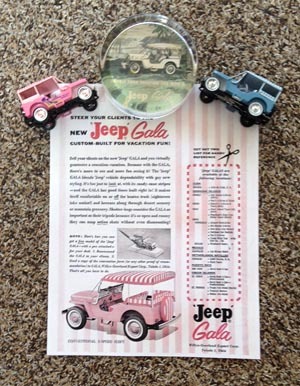 ), speedometer decal, decals for headlight switch, windshield wiper and key ignition as well as decal for the windshield wiper on the windshield, and the vent handle, all in their proper locations. It does incorrectly have the outline for a glove box, however. "The underside (30K JPEG) is detailed but unfortunately shows a transfer case with two driveshafts. It does have the engine pan, exhaust manifold and exhaust pipe and detailed springs on all four corners." 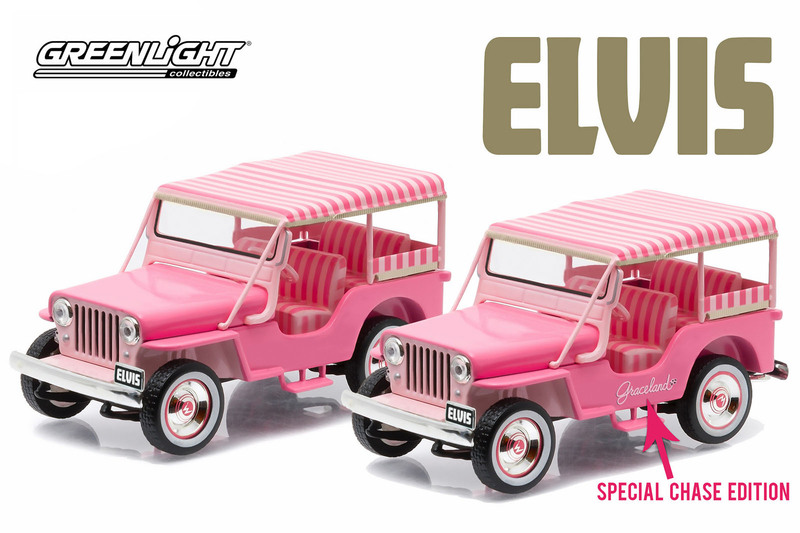 In 2016, GreenLight released a 1/43 "Elvis" Surrey which appears to be the same casting as the Altaya model above. Following the trend among toymakers to create intentional variations for collectors, GreenLight has applied the original "Graceland" name on the side of a few of the models. 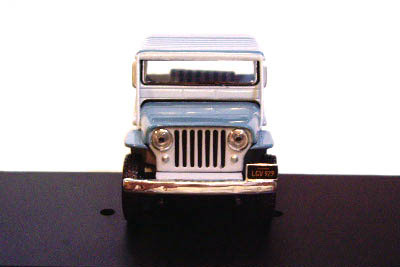 See Elvis Jeep Toys on CJ3B.info for more on the GreenLight Elvis series. 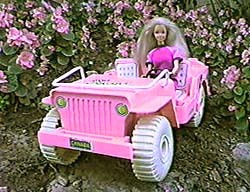 Barbie does have her own official Barbie Jeep in pink and other colors (as well as a Grand Cherokee) (20K JPEG), but I've always liked the one seen here, because it's a flatfender. Labelled the "Powder Puff," it's plastic and made by Empire of Tarboro, North Carolina. This example has stickers including a "Canada" licence plate. 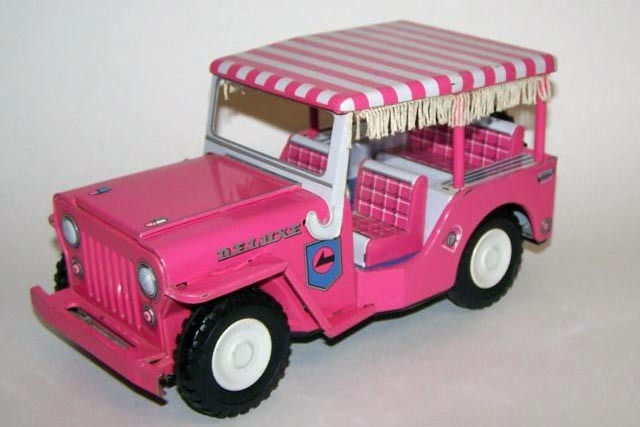 There's also the 1971 pink Matchbox Jeep Hot Rod. 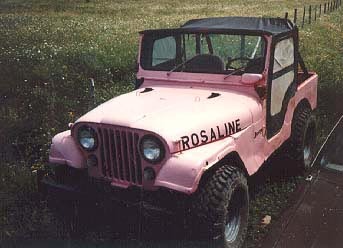 For years Rosaline (20K JPEG) was the only full-size pink Jeep I'd actually seen. 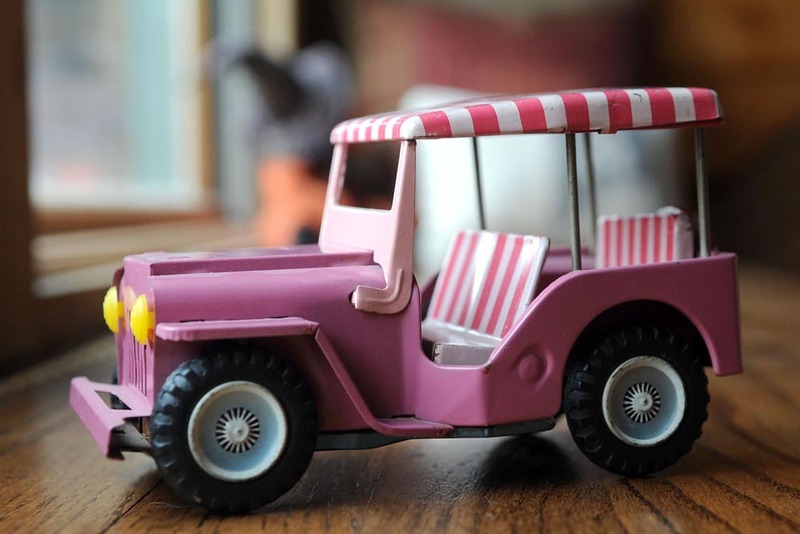 Elsewhere on the web, check out Pink Jeep Tours, who give guided tours around the beautiful red rocks of Sedona, Arizona. See also full size DJ-3A Surrey Gala Jeeps on CJ3B.info.